After a busy 2018 in which Enbridge (ENB) rolled up its MLPs to simplify its corporate structure, management delivered some bad news on March 1, 2019, announcing a one-year delay on the firm's $6.8 billion Line 3 Replacement Project. Shares fell as much as 6% the next trading day, causing some income investors to wonder what this means for Enbridge's dividend safety and long-term outlook. Let's take a look at how bad this news really is and what it could mean for Enbridge's dividend. 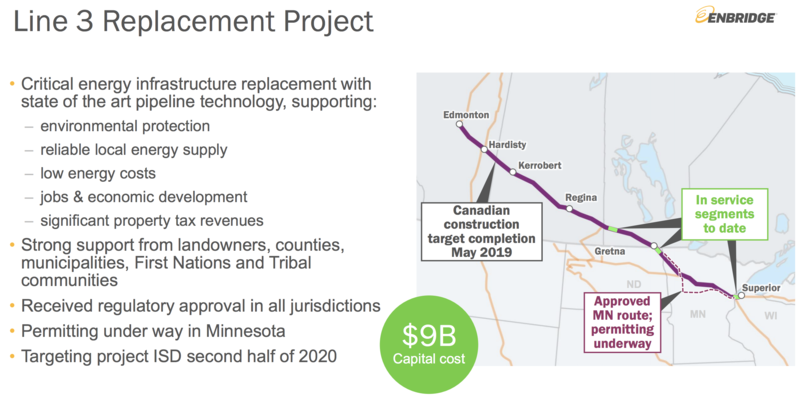 The $6.8 billion (CAD 9 billion) Line 3 Replacement Project is the largest part of Enbridge's $12 billion backlog of growth projects expected to be completed by the end of 2020. The replacement for the aging pipeline, which connects crude from Canada to pipelines that head to the U.S. Gulf Coast, would allow Enbridge to double the pipeline's capacity to its original rate of 760,000 barrels per day of Alberta crude. The project started in 2017 and is mostly complete, with the Minnesota segment representing the last part of the project. The completion of Line 3 is also expected to provide a cash flow boost that will allow management to hit its leverage target of 4.3 by the end of 2020. However, that plan called for Line 3 being completed by the end of 2019, and according to Enbridge, Minnesota regulators have told it that the final permits for the remaining section of the pipeline won't be coming until November 2019. As a result, the project's expected completion is now delayed 12 months to the second half of 2020. "The Company is developing a revised construction schedule for the Line 3 Replacement Project, but now expects an in-service date during the second half of 2020. More specific timing on the in-service date, as well as any potential impacts on the 2020 financial outlook, will be provided once the revised construction schedule is finalized. The Company's 2019 distributable cash flow guidance range of $4.30 to $4.60/share remains unchanged as a result of this permitting schedule." Management's 2019 cash flow guidance is largely unaffected since the project wasn't expected to go into service until the end of the year. However, until more information is known, Enbridge is unable to update its 2020 distributable cash flow guidance. What are the risks that this project ends up mired in endless litigation (like Kinder's Trans Mountain pipeline or TransCanada's Keystone XL) and cancelled outright? Fortunately, the odds of the project never being completed seem low. The Minnesota Public Utilities Commission approved the certificate of need for the project's completion in June 2018 and "unanimously denied petitions to reconsider the decision." Meanwhile, Enbridge has "reached an agreement with the Fond du Lac Band of Lake Superior Chippewa granting a new 20-year easement for the entire Mainline including the Line 3 Replacement Project through their Reservation." In other words, various environmental groups have attempted to get the project cancelled, including by trying to get Native American tribes who own land the project is scheduled to be built to block it. However, those efforts have failed, and this delay appears to be unlikely to result in a project cancellation. However, it is a setback, especially to Enbridge's 2020 cash flow growth plans. Here's what income investors need to know. Project delays and cancellations are one of the biggest short to medium-term risks pipeline giants like Enbridge face. While the company has a solid track record of completing projects, it has also faced its fair share of setbacks in the past. That includes canceling the Northern Gateway oil pipeline, a 12-year project after a Canadian court pulled its regulatory approval. This project failure was largely due to Enbridge not consulting with native tribes over which the pipeline was supposed to be built. This time around Enbridge has made sure to obtain full cooperation with all such affected tribes. It's also important to note that many analysts were already baking in possible delays on this project into their valuation models. Here's what Morningstar Senior Equity Analyst Joe Gemino had to say about the project delay"
"The delay comes as a little surprise to us – we previously expected the project to be placed into service during the first half of 2020...As a result, we now expect the project to be placed into service during the fourth quarter of 2020. Accordingly, we are lowering our 2020 EBITDA forecast from CAD 14.6 billion to CAD 14.1 billion, both of which are below management’s previously announced target. Given that Enbridge has probably learned from its past mistakes and obtained agreements from all necessary parties (regulatory and tribal), the cancellation of the project seems unlikely. In other words, this news probably represents only a temporary setback to Enbridge, rather than a thesis-breaking event. Enbridge's long-term appeal was based on two main factors. First, the company enjoys a predictable business model based on long-term, volume committed, and contracted cash flow in regulated industries. 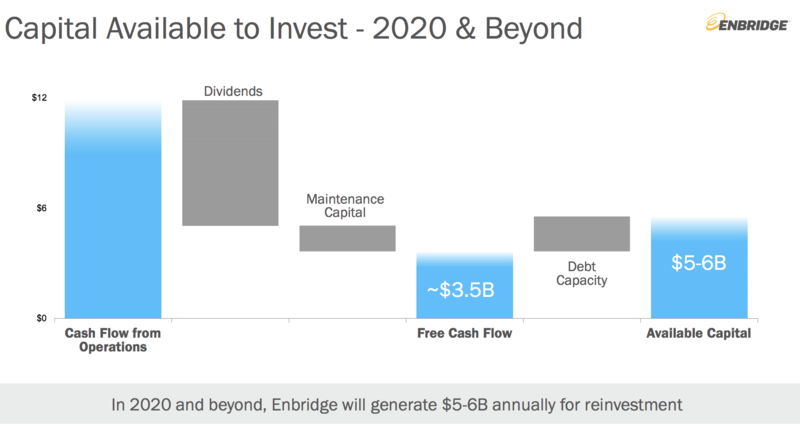 With 98% of EBITDA generated from take or pay, fixed fee, and/or regulated activities, plus 93% of cash flow from investment grade counter parties (including regulated gas utilities), Enbridge is able to deliver steady cash flow to support its dividend no matter what oil prices or the economy is doing. Importantly, management also targets a conservative 60% to 65% payout ratio as part of the firm's self-funding business model. As a result, Enbridge's growth potential and financing needs have no exposure to volatile equity markets. Even if Enbridge's share price were to significantly decline and remain low indefinitely, the company could fund its growth projects ($3.8 billion to $4.6 billion per year after 2020) with retained cash flow and modest amounts of debt, assuming it continued to have access to credit markets. 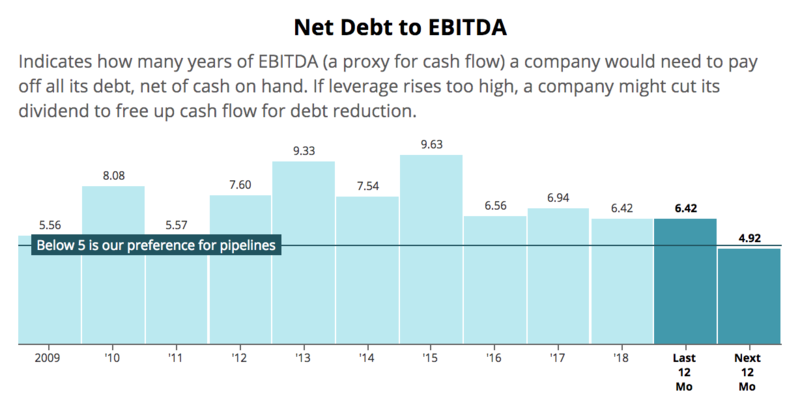 With a BBB+ credit rating (tied for the highest in the industry), Enbridge enjoys relatively low borrowing costs that should allow the firm to comfortably use debt to augment its approximately $2.6 billion per year in retained cash flow. Despite some new timing uncertainty with its largest project, Enbridge's dividend appears to remain solid with one of the more attractive profiles in the midstream space. As more information becomes known about its Line 3 Replacement Project and management makes progress on deleveraging, Enbridge's Dividend Safety Score has potential to improve as well. While major project delays are never good news, execution risk is something all midstream investors need to be comfortable with. Enbridge has been around since 1949 and has established a reputation for bringing projects into service on time and on budget. However, even the best management teams aren't perfect. Costly delays on major pipeline projects (or even outright cancellations) are an important risk factor that all shareholders need to be aware of. Fortunately, it appears as if the Line 3 Replacement Project will be completed eventually. 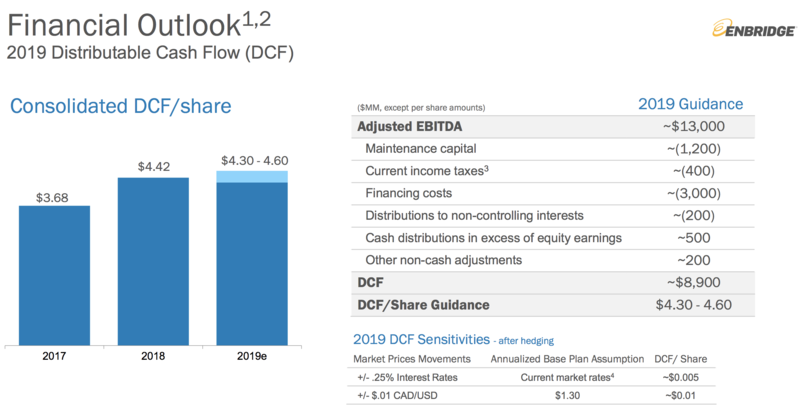 As long as that occurs, then Enbridge's long-term growth guidance of 10% payout growth in 2020 and 5% to 7% annual DCF per share growth beyond next year should remain intact. While there is always a chance that the project is ultimately scrapped, the good news is that even this major blow seems unlikely put Enbridge's dividend at risk. The firm's payout is secured by a healthy payout ratio, and management is working to strengthen Enbridge's balance sheet. Even in a worst-case scenario, it seems likely that Enbridge's dividend would merely grow slower than expected but wouldn't be at high risk of a cut.